Not only that you´ll get necessary soldering skills as well as all the required materials directly at the workshop but you will also learn how to do this workshop again with kids and young people if you want to re-share your new skills. No homework or shopping required just bring your curiosity and we will take care of the rest! 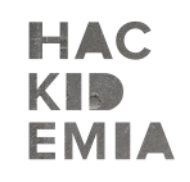 PhD & HacKidemia founder. I was also the Education Teaching fellow at Singularity University 2012 class where I advised and coached 80 students from 36 countries. As a former Googler I have a lot experience in web search infrastructure and international open education programs. I created two invention lab for kids: one in Paris and one in Cambodia.